Tis the season for Symmetry Snowflakes! Students at smARTStudio anxiously await for the day we celebrate the changing of seasons and the first fall of frosty flakes. Creating snowflakes is a wonderful way to encourage fine and gross motor skill development, reinforce visual art concepts (symmetry and shape), while incorporating literacy learning and science content. And because snowflakes are seasonal, rather than holiday specific, they’re a great addition to the studio’s decor until spring. PRE-SERVICE EDUCATORS/CLASSROOM TEACHERS & PARENTS/CAREGIVERS : Engage young learners with a provocation or invitation to create. Celebrate the snowy season by taking a nature walk, provide an opportunity to use descriptive words when talking about the snow, and encourage a sensory exploration of the fluffy flakes (remember, don’t eat that yellow snow). If you reside in a region that does not experience winter weather, take a virtual “field trip” by viewing video documentation of snow fall, winter walks, and/or visiting galleries of snowflake photographs. Smithsonian Institution Archives is an incredible resource for learning about Snowflake Bentley and the innovation of the photomicrographic process that he invented to document the unique qualities that exist in tiny frozen flakes of snow. 1. Begin with a piece of paper. (We make an effort to use our scrap “scratch” paper that we’ve saved throughout the year, students know to save any paper that they may have used to sketch ideas and are willing to donate to each year’s snowflake making sessions. Think out of the box : reuse junk mail, newspaper, construction paper, school worksheets, used wrapping paper, etc.) In order to create a Symmetry Snowflake, start with a square piece of paper. This is a great time to review shape, while choosing papers, ask young learners questions that encourage deep and critical thinking “Are we ready to make a snowflake? How do you know?” If the paper is a rectangle, fold and cut to create a square (as demonstrated below in photos). Save the extra piece of paper to craft paper chains or smaller snowflakes. I also find that creating in tandem alongside students helps in modeling the folding and cutting process. 2. Keep the square piece of paper folded. Encourage shape recognition, “Name the shape” (triangle) “How do you know?” (A triangle has three sides). Fold the triangle to create a smaller triangle : keeping the long folded side facing you, match and connect the points along that side. 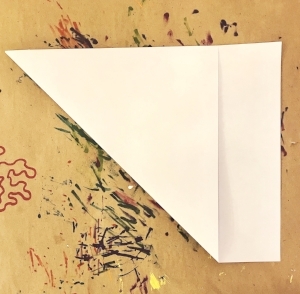 Allow young artists to compare/contrast the triangle shapes (if you’re creating in tandem, keep your triangle folded and discuss “What is the same/What is different” between the two triangle shapes of paper). 3. Keep the small triangle facing you like an arrow (See photos above) Place your pointer finger on the point that is pointing towards you and using the other hand, fold the side of the triangle in towards the center. (I found that placing this fold a bit past the center helps in the following steps to create the “cone” shape). 4. 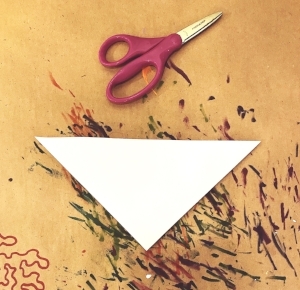 Fold the opposite side of the triangle all the way over to meet the outer edge of the shape. The result should be a cone shape with two “ears” (demonstrated in above photos). When the cone is flipped over (second photo above), there is a line that defines the top of the cone shape. Following that line, cut off the “ears” (the two triangle shapes coming out of the cone). 5. Cut a variety of shapes into all three sides of the triangle “snow cone” (demonstrated in above photo). Cutting off the tip of the cone will create interesting shapes in the center of your snowflake. Experiment and explore by cutting geometric and free form shapes. I give young artists an “art tip” that if you feed the scissor “alligator” all the way into the back of their mouth, the scissors will create a sharp cut. As the snowflake is unfolded, discuss the ways that the snowflake shows SYMMETRY (when folded in half, the snowflake is the same on both sides). Explore painting using brushes created from a collection of found natural materials. + A collection of natural materials. + Paint : As an educator that facilitates art making experiences for all ages, I love the versatility of acrylic paint. The colors are bright, blend easily, and clean up is a breeze. + Canvas : Stretched canvases and canvas panel boards are suitable for both wet and dry media. Feel free to explore acrylic painting on paper too! + Tape : When building natural brushes, I found that Duck Tape adheres to a variety of textures successfully and holds up through several painting experiences. + Paint Palettes : Reuse egg cartons, plastic containers and take out lids, and paper plates. Most of the learning at smARTStudio is inspired by the Reggio Emilia approach to early childhood education. Process based, student-led art experiences encourage young artists to discover, explore, and cultivate. One of my favorite core values of Reggio Emilia is the emphasis on nature. Providing opportunities to learn from the natural environment enrich learning and creativity, we try to wander the grounds surrounding the studio as much as possible to collect elements such as rocks, feathers, leaves, and branches. For this art exploratory experience, take a nature stroll to curate your own collection of natural tidbits and treasures. PRE-SERVICE EDUCATORS/CLASSROOM TEACHERS & PARENTS/CAREGIVERS : As you collect and curate natural elements to bring back into your curriculum, use this opportunity to make cross-curricular connections and provide multi sensory experiences. Discuss the life cycles of trees, plants, insects, and animals. Observe the time of day and season, notice the weather and the effect of light on the natural environment. We often draw our nature collection prior to painting, taking time to use descriptive words when smelling and touching each element. Ask questions to encourage higher-level critical thinking : "Name the colors you see" "Sort the leaves/flowers/rocks/branches from smallest to biggest" "How are the elements the same (compare)? How are the elements different (contrast)?" 1. Prep the natural elements for painting. Leaves, flowers, and fir needles make for fantastic brushes when taped to a collection of branches and twigs. 2. Prep a paint palette using egg cartons, repurposed plastic containers and lids, or paper plates. Drop small puddles of acrylic, we often focus on color theory and chose warm colors for our painting exploration. 3. Chose natural elements to dip into the colorful acrylic and paint the surface of your canvas or papers. Discuss ways to move the paint on the surface, discover color blending and the art elements of shape and line. Remember : Explore, Experiment, and Play!